(CBS News) NEW YORK - In an election year rush pushed primarily by Republicans, Pennsylvania has become the 16th state to adopt a strict voter photo ID law and the ninth state to do so in the past year. The law requires voters to produce a Pennsylvania driver's license or another government-issued photo IphilD, such as a U.S. passport, military ID, or county/municipal employee ID. The state will also accept college ID or personal care home IDs, as long as they are current and include an expiration date. Corbett is a Republican governor with Republican-led state legislature, just like six of the other eight states with new photo ID laws - Alabama, Kansas, South Carolina, Tennessee, Texas, and Wisconsin. Mississippi, a very Republican-leaning state with a Republican governor and legislature, opted for a referendum, which passed last November, while Rhode Island, which also passed a new ID law, has a Republican-turned-Independent Governor (Lincoln Chafee) and a Democratic-controlled legislature. The mainly Republican sponsors of these laws contend the measures will prevent voter impersonation fraud, although sponsors in every state are hard-pressed to provide examples of very rarely prosecuted crime. Supporters of South Carolina's new voter photo ID law recently pointed to data suggesting ballots had been cast in the names of dead people more than 950 times, however, an investigation by the state election commission found no proof of fraud and only clerical errors. When "CBS Evening News" researchers asked the Administrative Office of the Pennsylvania Courts today how many people had been convicted of voter impersonation or voter fraud in the past five years, the answer was zero. Opponents contend these laws are actually an attempt to suppress turnout among college students, minorities, and the poor -- Democratic-leaning groups that happen to be the most likely not to possess the ID's or to have the greatest hardship obtaining them. Pennsylvania Governor Corbett said any voters who do not have an acceptable form of photo ID would be to get one, free of charge, at any Pennsylvania Department of Transportation driver license center, provided they have the necessary documents, such as a birth certificate. Underscoring the national partisan divide on this issue, all five governors who vetoed voter photo ID laws in 2011 - in Minnesota (Mark Dayton), Missouri (Jay Nixon), Montana (Brian Schweitzer), New Hampshire (Jonathan Lynch), and North Carolina (Bev Perdue) - were Democrats facing down Republican-led legislatures. Pennsylvania's law will not be in effect for the state's presidential primary next month but will be in effect in November, when Pennsylvania's 20 electoral votes are at stake. At a minimum, nine states with 91 electoral votes, or one-third of the 270 needed to win the presidency will be affected, most significantly, Florida, with 29 electoral votes. 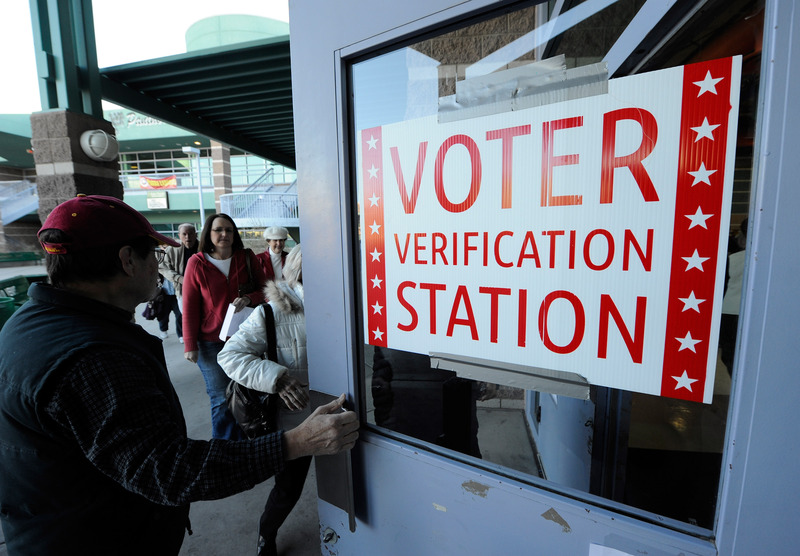 The Brennan Center for Justice considers the photo ID laws, along with new laws limiting early voting and voter registration, restrictive and wrong. "These laws represent the most significant cutback in voting rights in decades," said Wendy Weiser, director of the Brennan Center's Democracy Program, and co-author of a 2011 report on the laws. "Rather than erecting senseless barriers to voting, we should make our voting system work for all Americans by upgrading our ramshackle voter registration system." Before Pennsylvania, 15 states had adopted voter photo ID laws, according to a tally by the National Conference of State Legislatures. The nine states where the photo ID laws are in effect are Kansas and Tennessee (among the newcomers), plus Florida, Georgia, Hawaii, Idaho, Indiana, Louisiana, Michigan, and South Dakota, according to NCSL. The Supreme Court upheld the constitutionality of these laws in its 6-3 decision in a 2008 case over Indiana's law - Crawford v. Marion County Election Board. However, the Justice Department is already challenging the laws in two states using its powers under the 1965 Voting Rights Act to review changes to voting laws in states with a history of racial discrimination. This week the Justice Department blocked Texas's ID law, citing a discriminatory effect on Hispanic voters. In December, the department blocked South Carolina's law, citing a discriminatory effect on black voters. Both states are suing DOJ. Alabama and Rhode Island's laws do not take effect until 2014. Alabama is required to obtain DOJ approval, as will Mississippi - once it adopts legislation to implement the law - and Virginia, whose governor is expected to sign a recently passed voter ID law. A Wisconsin state judge this week declared the voter photo ID law passed by its state legislature last year unconstitutional; the state is appealing. Most of the new voter photo ID laws are what the NCSL calls "strict," meaning if a registered voter lacks an acceptable, government-issued photo ID, he or she cannot vote on Election Day. Instead, that voter may cast a provisional ballot that would counted only the voter subsequently proves his or her identity to voting officials in person with a photo ID within days. Sixteen states require voters to produce a non-photo form of ID before voting.